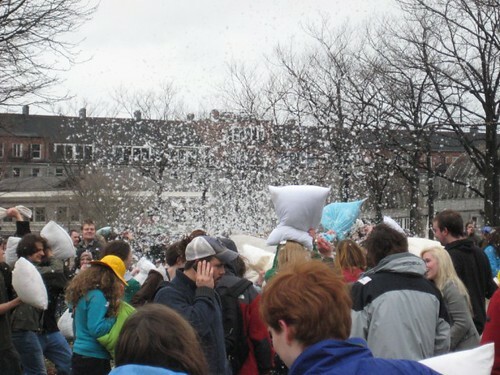 Yesterday was World Pillow Fight Day, a global event organized by pillowfightday.com. 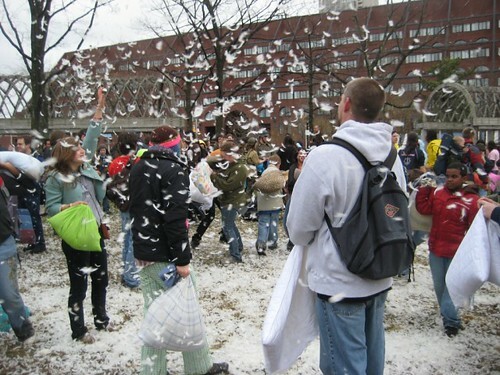 Each of the approximately 80 cities participating across the world were run by local groups. 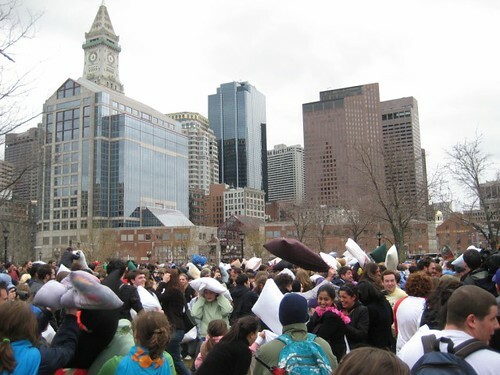 Boston, Massachusetts' was hosted by Banditos Misteriosos, a prominent organization in Boston that has hosted previous events, such as the Silent Dance Experiment, Scavenger Hunt, and the Revolutionary Water Gun Battle. 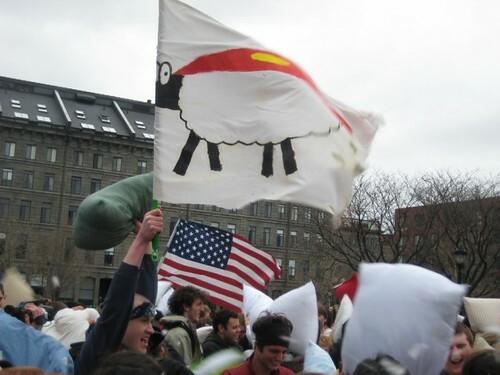 We did this same event last year in Copley Square, but had a far greater turnout this time around. 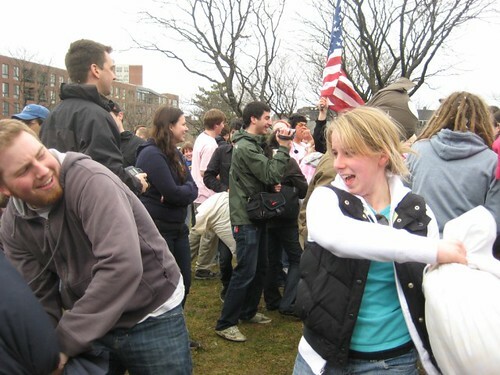 I heard estimates between 1,000 and 1,500 people for just Boston alone! 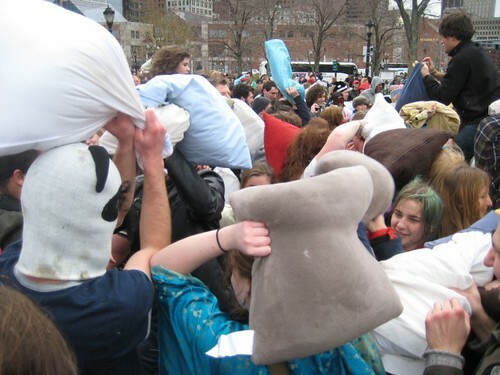 San Francisco's pillow fight reportedly had 5,000! 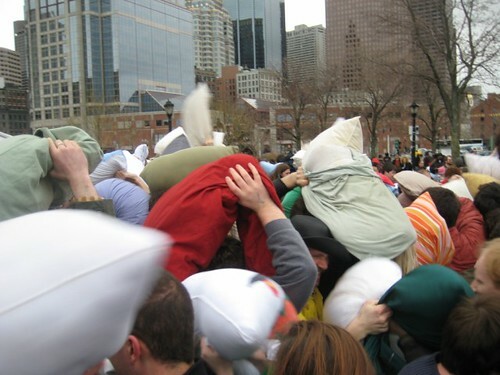 It is quite amazing to see how many people will come together from all walks of life just to have fun and hit each other with pillows. 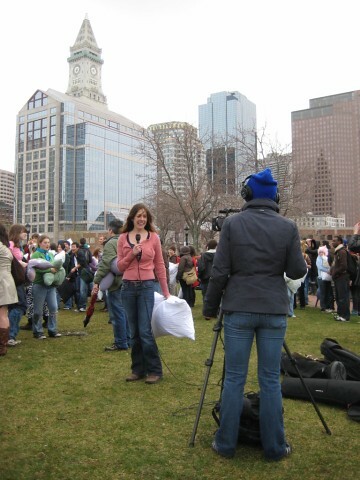 Boston's 2009 location was Christopher Columbus Park, a decently sized park right on the edge of downtown and next to the waterfront. Although everyone knew about the event for months, we were not told the exact location until midnight the previous evening. I arrived about 2:55 pm on this very windy April afternoon, with a chance of rain coming in the next few hours. I couldn't believe how many people had shown up. 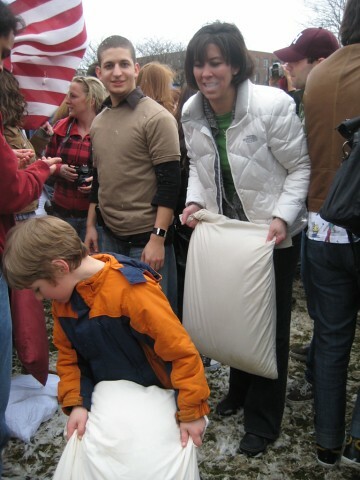 We were supposed to wait inconspicuously around the perimeter of the park and hide our pillows, but most of the participants must have not gotten the memo. 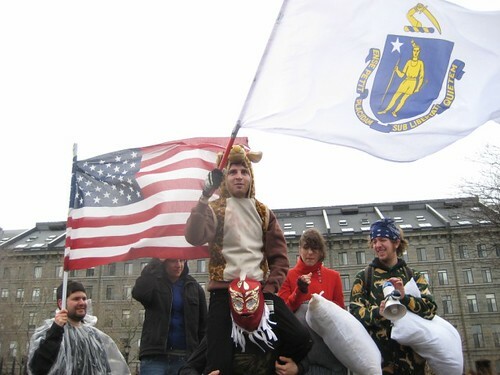 At the strike of 3 o'clock, an air horn siren began blazing and a man in a wrestling mask waving a Massachusetts state flag ran around the crowd in a giant loop. 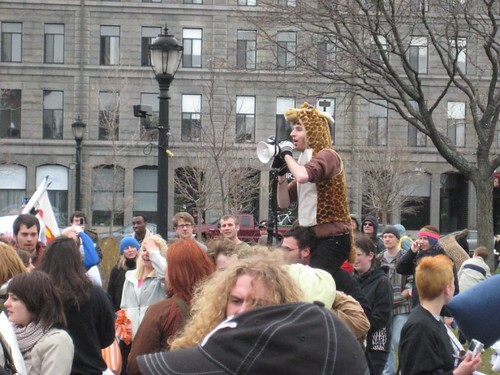 I ran along side him with my camera before crossing into a different part of the park, and then back into the bulk of the crowd. It made for a great video! 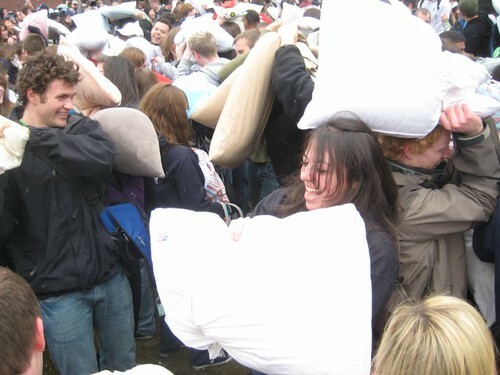 After an hour of getting beat in the head by pillows, taking 810 pictures in 60 minutes (a new personal record, by the way! 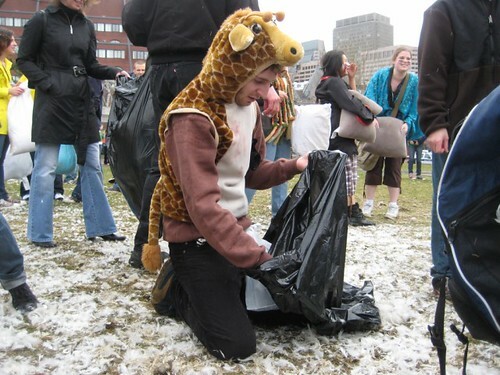 ), and recording 5 and a half minutes of video clips, the Banditos began cleaning up the mess of feathers that had been both trampled into the dirt and blown across the entire park. For the complete set of about 100 photos I released onto the Internet, visit my Flickr stream. If you, for personal or media use, would like to use any of my content, email me.